Ketron® PEEK grades offer chemical and hydrolysis resistance similar to PPS, but can operate at higher temperatures. 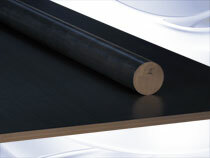 PEEK 1000 offers steam and wear resistance, while carbon-reinforced PEEK provides excellent wear capabilities. Our latest grade, PEEK HPV, offers outstanding bearing performance. PEEK can be used continuously to 480°F (250°C) and in hot water or steam without permanent loss in physical properties. For hostile environments, PEEK is a high strength alternative to fluoropolymers. PEEK carries a V-O flammability rating and exhibits very low smoke and toxic gas emission when exposed to flame. The addition of carbon fibers enhances the compressive strength and stiffness of PEEK, and dramatically lowers its expansion rate. It offers designers optimum wear resistance and load carrying capability in a PEEK-based product. This grade provides more thermal conductivity than unreinforced PEEK -- increasing heat dissipation from bearing surfaces improving bearing life and capability. This series of PEEK materials were developed specifically for Life Sciences applications and are pre-qualified biocompatible materials, helping to save precious time and money. Approved for both the United States Pharmacopeias (USP) and ISO 10993-1 by successfully passing a series of biocompability tests these products are implantable for up to 24 hours with Ketron PEEK CLASSIX up to 30 days. Injection Molded Ketron® PEEK advanced polymers shapes are ideal for machined back-up rings and v-seals. Ketron® PEEK offers excellent chemical and wear resistance across a broad range of operating temperatures. In addition to the widely used Ketron 1000 PEEK grade, several specific grades are available that incorporate glass or carbon fibers, or wear resistant additives that increase the wear life of machined parts.